The Twits:Real Celebrities. Real Tweets. Real Funny. They're rich, they're famous, and they're tweeting. And you won't believe what they're saying - the finniest, the dumbest, and the most ridiculous celebrity tweets are all here, in one spot. See silly feuds (Demi Moore vs. Kim Kardashian) and nonsense rants (Charlie Sheen) alongside genuinely funny quips (Steve Martin) and (let's call it, interesting) poetry (Yoko Ono). It all makes for an unprecedented look at The Twits - those tweeting celebrities with something funny to say. What do they do at the glamorous parties they attend? According to P. Diddy’s Tweet "ITS FRIDAY NIGHT! Remember- Don’t Drink the pee-pee!" What are the five-star restaurants that they dine at? Kristin Cavallari Tweeted "I love homemade turkey sandwiches" and Kanye West Tweeted "Drinking New York tap water"
Well…maybe their lives are not always glamorous, but they sure are entertaining! Luckily for us celebrities give us a play-by-play glimpse into their worlds through Twitter. With over 1 million Twitter users speaking their minds daily, celebrities are no exception. "The Twits", a first of its kind book, offers up a compilation of the most comical Tweets from your favorite celebrities, including Jessica Simpson, The Kardashians, Snooki, and Sarah Palin all in one book. Organized by trending topics like #TooMuchInformation, #ADayInTheLife, and #CharlieSheen, "The Twits" will be sure to give you a hilarious look into celebrity pop culture. It seems like every day there's another celebrity or politician in trouble for something they said on Twitter. Apparently, no matter how much fame or money you have, there's still something appealing to sharing your thoughts 140 characters at a time. For some, it's a way to stroke their substantial egos. For others, it seems to be a way to share their unlimited supply of comedic gold. Good or bad, celebrities who tweet give us a peek into their lives like never before. I must say this is quite an entertaining book. I do follow some of the celebrities on Twitter, but this book has packed with the most interesting and funniest tweets from the famous stars. I sat on my desk and already read the entire book. Some of the tweets from them may make you think, "What?" and some are just too funny that made me laugh. My son looks at me like I'm crazy. haha! Whether it's funny, offensive, or just non-sense, celebrities dish it all on Twitter and let us know how they really feel! 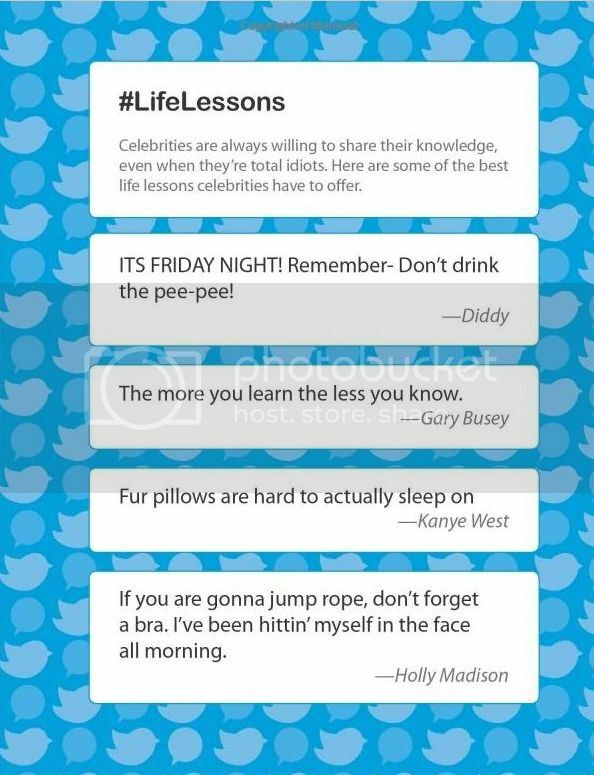 Quinn Conroy did a great job putting together a collection of the most funny celeb tweets in his book. One (1) lucky reader will have a chance to win their very own copy of "The Twits" by Quinn Conroy. Chosen winner will be selected via Random.org through Rafflecopter and is open to US & Canadian residents (ends June 2, 2012 at 11:59pm EST). Winner will have 48 hours to respond to claim their prize. Disclosure: I was given a complimentary copy of the book from the Publishing Company/PR Firm in exchange of my opinion in this post. Any expressed opinions are my own and personal thoughts. No other compensation was given. I don't currently follow any celebs - but I have peeked in on the Kardashians!